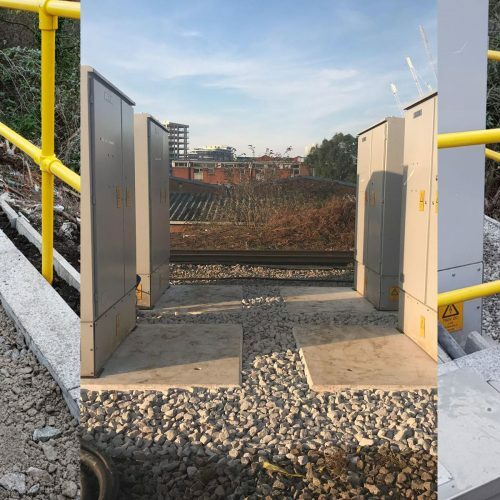 Rail teams from RJ Power Rail were delivering works during a busy Christmas 2018. Working on three sites as part of the company’s Safer Smarter Isolation Programme for Network Rail, Wessex, the teams delivered all works on time, safely and without incident. RJ Power Rail installed a 2-track UTX at Shalford Junction. This was a very interesting project, as the UTX was being installed in order to contain cabling that was previously installed by another contractor, encased within rigid ducting between the railway sleepers. RJ Power Rail’s scope included de-commissioning the existing installation in order to remove and divert the cabling. The rail team, then proceeded to install the 2-track UTX and modify the existing cable containment. Once the UTX had been installed, the cabling was then reinstated, which enabled RJ Power Rail to re-commission the CMSD installation. RJ Power Rail’s team successfully completed the planned installation of cables and civil routes – including a new GRP handrail – at Ludgate Junction, Clapham. With Clapham Junction being the busiest Station in Great Britain, having over 28 million trains through its station last year, it made perfect sense to complete these important works during the holiday period. The rail team were committed this Christmas 2018, to undertake deliveries, civil works, cabling and terminations at Queenstown Road. This particular location was extremely challenging, as all the CTS Units and associated works were ‘rail locked’ and therefore could only be accessed with a rail possession. Despite some logistical challenges on the day, RJ Power Rail’s team made a fantastic effort to complete all the required works.